The next major Blade & Soul update brings several impactful changes to core items and systems. No cost reduction on Aransu 6-9. Is this an out of season, April fools joke? Generally it looks good so far, but I dont understand why would we need 96 HQ hearts to go from Exalted 9 to aransu 9, person who even wants to switch there wont ever have that many hearts and if it was meant to reduce abusement of the system I dont think it should require THAT MUCH, really. Person who dont go arnasu obviously has no raid so you are pretty much ****** him over. o.O Where is the reduction to aransu 6 - 9? No reduction for Raven 3-9 either. I guess I'll be stuck forever. Oh well. pls one question about the Bloodstone Fragment and Bloodstone, are those going to be bound to account or bound to character? I would imagine they would make them bound to account so you can transfer between alts like bravery coins ect would make the most sense. Hopefully they will consider it. Wasting PTS on Raven is just... well, waste. Especially for those who crafted/bought 5 Empyrean Spirit Stone to be good enough for random f8 and now stuck on that path with no help from support. I'd also like to know why the random day was removed. Aside from getting the same map 4-6 times in a row being annoying, it was actually nice to have a day where you could do all BG daily quests at once. From storm dragon stage 9 to aransu 9.Will be now 96 hearts instead the 25 this change no make sence you just fuked so hard all non raid players.I wont be surprised if people start quit the game with all greed is need to upgrade alternative path to now cant swap because you need 96 hearts and each is 50g in market. Kinda disappointed that there isn't a cost reduction for Aransu later stages, but more disappointed in still not getting a reduction in Pet Pods needed for pets, that **** is insane. Also the notes mention the amount of Legendary Gem hammers needed for slots 7 and 8 is 22 per stage, so 44 total. IIRC, on the KR server this differed between Baleful, Raven, Aransu and GC weapons; is the amount of gem hammers mentioned in the patch notes for a specific weapon stage, or do the sockets on all weapon stages cost the same? Actually this change makes perfect sense. You need 150 hearts to go aransu 3 -> aransu 9. The storm dragon/exalted weapons are meant to be easier to get, weaker alternative to aransu for those who doesn't want to do raids. Not just a way to skip farming raid materials when aiming for aransu 9. What i really want to know is if we are getting our exp back by having our levels increased. 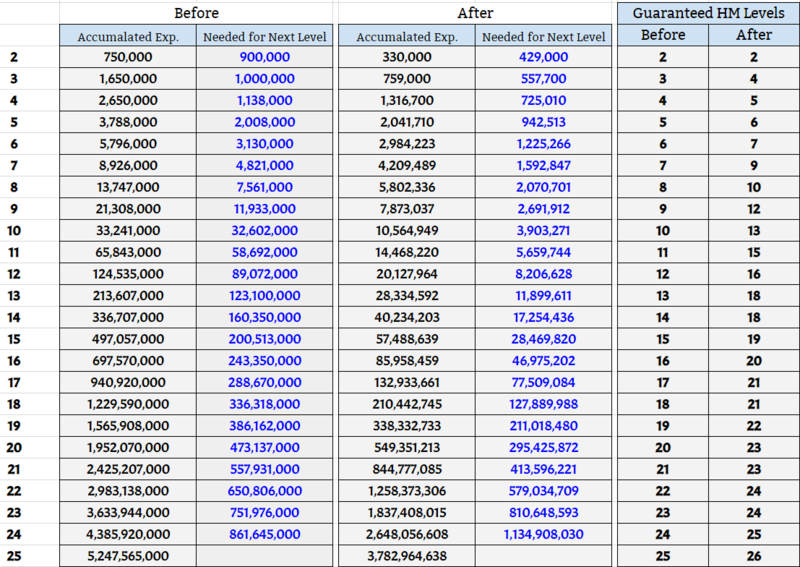 Accumulated XP stays, so your level will be increased. Did NC actually say that somewhere?cause if they didn't it could be a last minute suprise.Wouldn't be the first time anyway. It's what Jonathan said on his last tweet. If they will keep their word is another history..
Is it a typo or why is the Legendary Element Cost Reduction for Dawn/Riftwalk 7-9 to Exalted/Storm 1-3 --25>20 and on live its only 10 , do u mean its gonna be 10>20? Curious: with the removal of bravery coins, it removed one of the ways to craft a pet pod. Will there be another recipe to compensate for this change? Crafting and transmutation recipes that used Bravery Coins now use Bloodstone Fragments. Next time just read the whole announcement. So any1 can help me for calculate it? im hm12 with 60m exp rn if i level up to 13 i will be level hm18 with patch but if i stay at hm12 how many level i can get with 60m exp? Which means it will require double, or quadruple, the amount of fragments.